Continuing the question of Ogee snowshoe: black swan or new strategy? 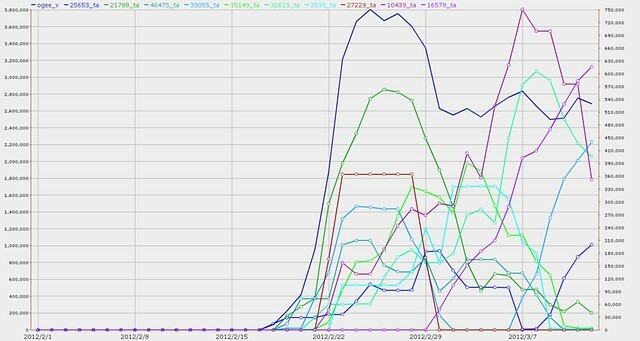 let’s look at Ogee snowshoe spam in the first week of May 2012. However, the dotted line rising to the top right that pulled the solid overall snowshoe volume line back up is not a hosting center: it’s an ISP. CDM’s AS 6428 appears to be operating as Primary Network, whose first services are T-1 Internet access and metro Internet. And Primary Network is not alone. We’ve pulled out a list of all the ASNs affected by Ogee snowshoe so far, and quite a few of them are ISPs, some of them very well known ISPs. Snowshoe: it’s not just for hosting centers anymore. This entry was posted in Economics, Forensics, IIAR, Intenret coordination, Internet risk management strategies, IT Security, Law, Ogee, Reputation Systems, Research, Snowshoe, spam, SpamRankings.net and tagged BurstNet, CDM, Economics, Forensics, hosting, IIAR, Intenret coordination, Internet risk management strategies, ISP, IT Security, John S. Quarterman, Law, NOC, Ogee, Primary Network, RapidSwitch, Reputation Systems, Research, snowshoe, spam, Spam ranked as a sneeze for infosec disease, SpamRankings.net on May 9, 2012 by John S. Quarterman. A week ago you may recall most of March’s crop of Ogee spamming ASNs had subsided. Yet there were some contenders coming up from the bottom right corner of the graph. Some correspondents say snowshoe spamming such as Ogee is a black swan, unanticipated and short-lived. I say it may be a change in strategy. Others say the actual spam coming out of Ogee is not the same campaigns as we’ve seen from botnets, so spammers are not moving over. To which I say: yet. And if snowshoe spam is big enough to change worldwide SpamRankings.net, and if it continues, that’s a strategy change. We’ll see how all that goes. Meanwhile, what’s happened in the last week or two? This entry was posted in Economics, Forensics, IIAR, Intenret coordination, Internet risk management strategies, IT Security, Law, Ogee, Reputation Systems, Research, Snowshoe, spam, SpamRankings.net and tagged black swan, John S. Quarterman, Ogee, snowshoe, spam, Spam ranked as a sneeze for infosec disease, SpamRankings.net, strategy on April 26, 2012 by John S. Quarterman. Peaking at the end of March 2012, the Ogee snowshoe spam winner is AS 16226 GNAXNET-AS – Global Net Access LLC. GNAXNet actually placed another Autonomous System in the same time frame, AS 3595. U.S. Brinkster’s AS 33055 BCC-65-182-96-0-PHX finally cleaned up its act and went to zero Ogee volume 11 April 2012. Canada’s AS 32613 IWeb also went to zero on 23 March 2012. On the other hand, it looks like a new surge of snowshoe spam is starting mid-April, including some organizations maybe not usually considered hosting companies, such as Cogent’s AS 174. Meanwhile, Belarus’ AS 6697 BELPAK-AS already went from #7 to #5 worldwide in March, pushing Belarus up from #16 to #12 among countries. And NOC’s AS 21788 keeps on rolling waves of snowshoe spam. All these volume numbers and rankings are provisional, especially considering we’re seeing so many ASes and netblocks that were previously not spamming that we’re tuning our database to be sure we’re properly accounting for them all. This entry was posted in Economics, Forensics, IIAR, Intenret coordination, Internet risk management strategies, IT Security, Law, Reputation Systems, Research, Snowshoe, spam, SpamRankings.net and tagged Belarus, BELPAK, Canada, Cogent, Economics, Forensics, GNAXNET, IIAR, Intenret coordination, Internet risk management strategies, IT Security, iWeb, John S. Quarterman, Law, NOC, Ogee, Reputation Systems, Research, snowshoe, spam, Spam ranked as a sneeze for infosec disease, SpamRankings.net, U.S. on April 17, 2012 by John S. Quarterman. This problem is bad enough that Canada rose from country #46 in January to #34 in February and #25 in March. You can’t see that on the countries top 10, like you can for the U.S., which snowshoe spamming pushed to #1 worldwide in March, but internally SpamRankings.net keeps track of rankings of all countries worldwide, and indeed Canada went form #46 in January to #25 in March. This entry was posted in Economics, Forensics, IIAR, Intenret coordination, Internet risk management strategies, IT Security, Law, Reputation Systems, Research, Snowshoe, spam, SpamRankings.net and tagged Canada, Economics, Forensics, IIAR, Intenret coordination, Internet risk management strategies, IT Security, John S. Quarterman, Law, Ogee, Reputation Systems, Research, snowshow, spam, Spam ranked as a sneeze for infosec disease, SpamRankings.net on April 16, 2012 by John S. Quarterman. Previously unseen Brinkster’s AS 33055 BCC-65-182-96-0-PHX took first place. AS 10439 CARINET leapt from #8 last month to #4 for March for the U.S., and was up to second place at the end of the month. Six ASNs joined the U.S. top 10: were they all due to snowshoe spam, too? Brinkster was so bad it made #8 on the world top 10! Last month’s winner AS 21788 NOC finally cleaned up its act a bit, dropping from #1 to #5. Six ASNs dropped out of the top 10. Four of them (Webhost-ASN-1, LIMESTONENETWORKS, PEER1, and ATMLINK) popped to the top 10 last month due to snowshoe spam. The other two (NTT and Charter’s ASNs) didn’t even have to spam less to drop out, because this month’s top 10 had so much more spam. This entry was posted in Economics, Forensics, IIAR, Intenret coordination, Internet risk management strategies, IT Security, Law, Reputation Systems, Research, Snowshoe, spam, SpamRankings.net and tagged botnet, CAN-SPAM, IIAR Project, infosec, John S. Quarterman, Law, March 2012, snowshoe spamming, spam, Spam ranked as a sneeze for infosec disease, SpamRankings.net on April 12, 2012 by John S. Quarterman.